Transforming growth factor beta (TGF-β) is a protein that controls proliferation, cellular differentiation, and other functions in most cells. TGF-beta family member binds to the Type II receptor and recruits Type I, whereby Type II receptor phosphorylates and activates Type I. The Type I receptor, in turn, phosphorylates receptor-activated Smads ( R-Smads: Smad1, Smad2, Smad3, Smad5, and Smad8). Once phosphorylated, R-Smads associate with the co-mediator Smad, Smad4, and the heteromeric complex then translocates into the nucleus. 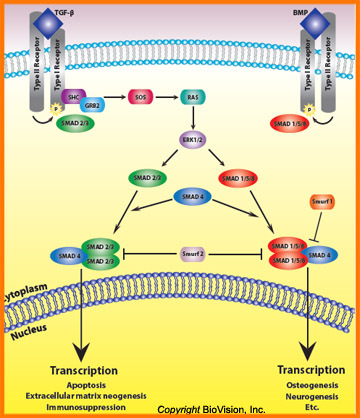 In the nucleus, Smad complexes activate specific genes through cooperative interactions with other DNA-binding and coactivator (or co-repressor) proteins. In general, the release and activation of TGF-beta stimulates the production of various extracellular matrix proteins and inhibits the degradation of these matrix proteins which contributes to tissue repair. However, excessive TGF-beta may contribute to a pathologic excess of tissue fibrosis such as in renal fibrosis. Prolonged exposure of cells to hyperglycemia is the basis for a variety of diabetes-associated complications, including diabetic nephropathy, a major cause of diabetes-associated death. An important factor in diabetic nephropathy is the extensive fibrosis, which appears to result from hyperactivity of TGF-beta signaling. It has been shown that leptin can stimulate mRNA expression and protein secretion of TGF-β1 which is one of the key regulators of extracellular matrix (ECM) genes in mesangial cells and can contribute to extracellular matrix deposition, glomerulosclerosis, and proteinuria. As an additional note, studies have shown that in response to high glucose, cells can activate TGF-beta signaling through a direct enhancement of cell surface presentation of the TGF-beta receptors which has a direct effect on TGF-beta ligand activation. Finally, elevated glomerular TGF-b1 levels have been shown to make a significant contribution to the pathogenesis of diabetic glomerular lesions, including accumulation of type I collagen.